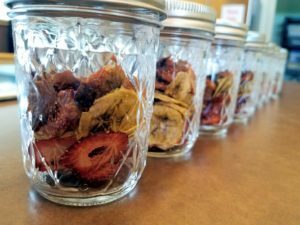 Home food preservation classes are offered during the summer months. Classes offered include boil water bath canning – jams & jellies and pickles, pressure canning – low-acid veggies, and drying & freezing. If you have a pressure canner with a dial gauge, you may bring in your canner with the lid so that your gauge and gasket can be tested. This is FREE of charge. You may drop your canner off at either the Duplin or Sampson County Extension offices along with your name and phone number or you may call to schedule a time for your canner to be tested. Your canner will be tested and available for pick-up within the week. This food preservation series is sponsored by United Way of Sampson. To register for a class in the Food Preservation Series, please call the Sampson County Cooperative Extension office, 910.592.7161. For more information about Home Food Preservation, please contact Sydney Johnson at Sydney_johnson@ncsu.edu.